This story was updated at 10:33 a.m. ET. Spaceshuttle Discovery is set to launch on its final flight next week, concluding a nearly three-decade legacy as arguably the most historic orbiter in NASA's fleet. Thefirst of NASA?s three remaining shuttles set to retire, Discovery was the thirdorbiter built and the one launched the most times into space. Itsfinal mission, STS-133, is scheduledto launch Tuesday (Nov. 2) at 4:17 p.m. EDT (2017 GMT). The launch will markthe Discovery's 13th visit to the International Space Station (ISS) and its39th trip into space. Discoverywill deliver to the station the Permanent Multi-Purpose Logistic Module (PMM),the last U.S. room to be added to the orbiting laboratory to serve as a storagecloset for the station?s supplies and spare equipment. Alsoon board is Robonaut 2, the firsthumanoid robot to fly in space designed to assist astronauts inside andeventually outside the outpost. Scheduledto last 11 days, Discovery?s last flight will bring its total time in space tomore than 360 days ? nearly an entire year flying around Earth. ?Itwill have flown about a year on orbit by the time we are done with it, which ispretty remarkable for a space shuttle,? said Discovery's commander StevenLindsey, who is making his third flight on the storied space plane. Discoverywas built between 1979 and 1983 and made its maiden flight on Aug. 30, 1984,from NASA?s Kennedy Space Center in Florida. But before it could depart on the six-daySTS-41D mission, Discovery experienced the shuttle program?s first pad abort. Afirst launch try, attempted two months earlier, ended just four seconds beforeliftoff. Discovery?s three main engines shut down, which was then followed by ahydrogen fire on the pad. "Gee,I thought we?d be a lot higher at MECO!? radioed mission specialist SteveHawley from onboard the shuttle at the time, referencing NASA's term for mainengine cutoff. Discovery flew to space five more times? mostly to deploy satellites ? beforestanding down after the shuttle Challenger accident in January 1986. Twoyears later, Discovery was the first orbiter to return to flight. ReturningNASA's shuttle fleet to flight after a major tragedy is a role Discovery servedagain 17 years later, in 2005, following the 2003 loss of the orbiter Columbia. ?Itwas the pathfinder as we put new systems in place, new safety features,? saidlaunch integration manager Mike Moses. Betweenits STS-26 mission in 1988 and STS-114 return to flight in 2005, Discoverylogged 23 more trips to space, making history along the way. ?Quitea remarkable historyfor Discovery, it's had a whole bunch of firsts,? Moses said. Amongthose firsts was the first Russian cosmonaut aboard a U.S. mission, the firstrendezvous with the Russian space station Mir, the first female pilot and thefirst crew rotation for the International Space Station. Discoveryalso set the record for flying the oldest crew member in history ? 77-year-oldMercury-astronaut-turned-U.S.-senatorJohn Glenn ? and recorded the highest altitude reached by any shuttlemission. Thatshuttle altitude record was set in 1997 during a mission to service the HubbleSpace Telescope, a payload it first deployed into orbit seven years earlier. Discovery,NASA?s oldest shuttle still in service, was instrumental to the assembly of theInternational Space Station, delivering the largest module ? Japan?s Kibolaboratory ? and the final segment for the outpost?s ?backbone? truss, amongother components. Overthe course of its 26 years in service, Discovery has racked up an impressiveset of statistics unmatched by any other spacecraft in history. Asit stands today before flying on STS-133, Discovery has logged 142,917,535 milescircling the Earth a total of 5,628 times. Ithas carried 183 astronauts and cosmonauts to and from space, filling 246 seatson 38 missions. AndDiscovery docked with space stations 13 times: once with the Mir outpost and 12times with the ISS. Allthese numbers add up to a historic legacy, STS-133 mission specialist NicoleStott said. ?Itis an historic thing, I think, that we have such a special vehicle to fly. Inaddition to the hope we will have a successful mission, in conclusion we willbe celebrating the real significance of the vehicle itself,? she said. 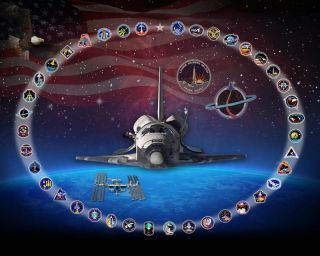 ?Wehave to look at this [STS-133 mission] as a celebration of just how wonderfulDiscovery has performed and just how fantastic a team that has put it togetherand worked to make it happen.? SPACE.comis providing complete coverage of the last voyage of space shuttle Discovery. Click here for mission updates,new stories and a link to NASA's live webcast coverage. Stephanie Pappas is aSenior Writer for LiveScience, asister site of SPACE.com.